On my front patio I have the remnants of what used to be a large Rosemary herb sharing a planter with a Begonia. The aromatic Rosemary originally was a little plant, shaped like a Christmas tree, which my mom’s husband gave me for the holidays, about 8 years ago. I transplanted it a couple of months later into a large planter and it grew quite big. People would regularly admire it, when they walked by my front patio and saw it. Several neighbors would cut pieces from it, to use its needle-like leaves for cooking. Then I went away for a long trip. When I returned I found that the once splendid Rosemary had dried out and just about died. So I cut all the dead branches off, leaving only a couple of twigs that were still green. I planted a little Begonia in the same planter to accompany the Rosemary. 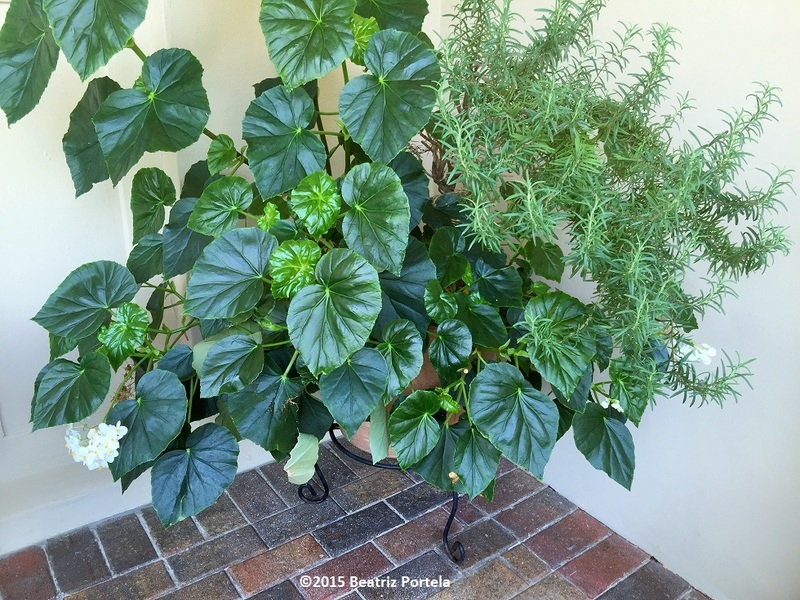 The Begonia had belonged to my next door neighbor Stephanie, who gave it to me when she moved away. Now the Begonia has gotten huge and has practically taken over the container. Aside from being beautiful, this planter holds special memories for me, as both people who gave me the plants have passed away. These plants look very healthy. What a beautiful thought! They will keep memories alive. I love it, yes every plant has a story. And this makes me remember to take cuttings from the rosemary growing at the Fruit & Spice Park at Wednesday nights volunteer work evening. It is a different variety, it grows very large and it blooms. Few get to see the flowers of rosemary since it is too hot in South Florida but it is a beautiful ornamental plant as well. We’ll attempt to grow these to share at GrowFest in October. I’ll have to take a look at the Rosemary at the Fruit & Spice Park! I haven’t been there in a few years. Another great tribute to special friends/family. A lovely planter with such special plants!